On April 24th MOAS deployed its vessel, the Phoenix, for a one-month observation mission to learn more about sea crossings along the Andaman route. Following news of shipwrecks and attempts to reach safety, MOAS wanted to shed light upon an underreported phenomenon that claimed the life of many people fleeing violence and persecution. Rohingya people belong to a Muslim stateless minority, mainly living in Northern Rakhine (Myanmar), and have been victims of cruel persecutions by the Burmese government for a long time. In 1982, Rohingya were not included in the list of 135 ethnic groups that were granted Burmese citizenship, and during a recent census either they were forced to register as “Bengali” or not counted at all. So, data about their presence in Myanmar are inaccurate. Since last August 25th violence escalated, life became unbearable, and an unprecedented exodus pushed around 700,000 people in Bangladesh where they arrived after horrific journeys and in devastating psychophysical conditions. This is why last September MOAS decided to start a mission in Bangladesh to mitigate the suffering of this persecuted minority and support the Bangladeshi government that shared land and resources. Nonetheless, the land route or the Naf river crossing are not the only ways to seek sanctuary for people whose houses were set on fire to, whose families was devastated and lives destroyed. Since the beginning of the Rohingya exodus, sporadic crossings and shipwrecks were reported due to poor patrolling activities in the area. This is why MOAS decided to react and collect information to raise awareness at international level. After sailing and being intimidated by the Thai Navy, on May 6th during our stop in Langkawi, we heard news of a wooden boat with 30-70 Rohingya people on board. They had left Sittwe (Myanmar) to reach Malaysia, a desired destination for desperate Rohingya hoping to find a job and start a new peaceful life. 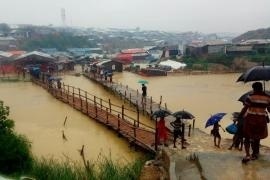 We immediately defined an operational plan in the hope to rescue people in distress, if necessary, and on May 8th we headed toward the patrolling area, following different potential routes, before international media agencies reported that the Rohingya boat had to return back due to an engine failure. Even upon confirmation of this information, there were still huge concerns about the fate of the people on board. According to news available, Burmese armed forces could have arrested Rohingya people who tried to flee Myanmar and forbade access to the area. From an operational point of view, the Andaman observation mission was successfully completed, but we lament the lack of cooperation and support from regional authorities. We are also deeply concerned that Rohingya rights are not properly safeguarded, especially if the long-debated repatriation plan takes place. News from Myanmar are not encouraging. As highlighted by UN Special Rapporteur on the situation of human rights in Myanmar, Yanghee Lee, information gathered on the ground depict a real “genocide” at the detriment of the Rohingya community and focus on unspeakable violence and cruelty affecting even women and children. Amnesty International, supported by the UN, covered this issue last February and March. According to Rohingya testimonials, even though violence appears to have been decreased, persecution is still going on and it is perpetrated through robberies, rapes and systematic sexual violence against women and girls. Additionally, those who are still inside the country are literally starving. Some witnesses affirmed that they had to escape because they were not able to get enough food. In light of such a scenario, I wonder how we can accept that the international community is not taking strong action. In 2018 we thought we’d seen an end to the horrors thanks to a more or less common and shared culture of human rights. Nonetheless, the Syrian war, casualties along the Central Mediterranean and Aegean Sea, the Rohingya exodus in Bangladesh and their inhumane living conditions in Myanmar contradict this idea. Peace, security and the right to a decent life cannot be exclusive privileges of those who live in the right part of the world. Believing that our indifference has no consequences is pure illusion. It is fundamental to cooperate at all levels in every part of the world in order to abandon emergency approaches and adopt long-term strategies to address global migration flows in a rational and human way.